“My tent doesn’t look like much but, as an estate agent might say, “It is air-conditioned and has exceptional location.” ― Fennel Hudson, A Waterside Year – Fennel’s Journal – No. 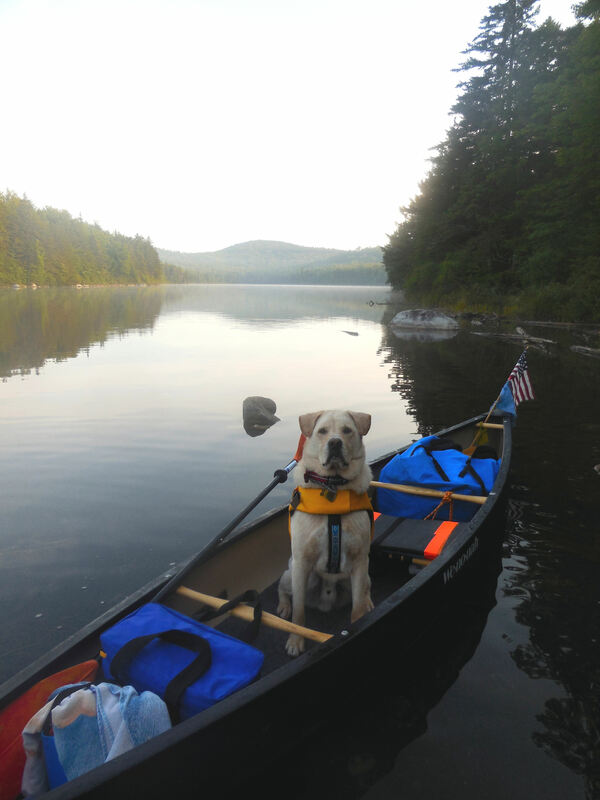 2 | Vermont Paddle Pups! It is what a tent does not have, that has appealed to me lately…no cellphones, no computer, no crowds of people….After a challenging few months, life has begun to resume some type of a normal routine. 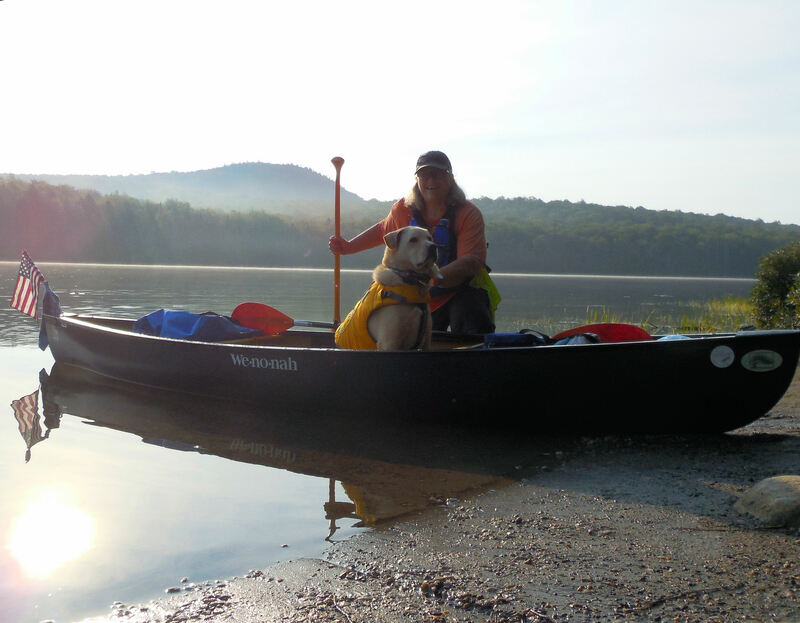 I had planned on beginning to take some solo camping trips with Gryphon, using my solo Wenonah canoe. Since circumstances had postponed those plans, it was with bittersweet enthusiasm that I loaded up the boat to take Gryphon out for an overnight at Green River Reservoir. 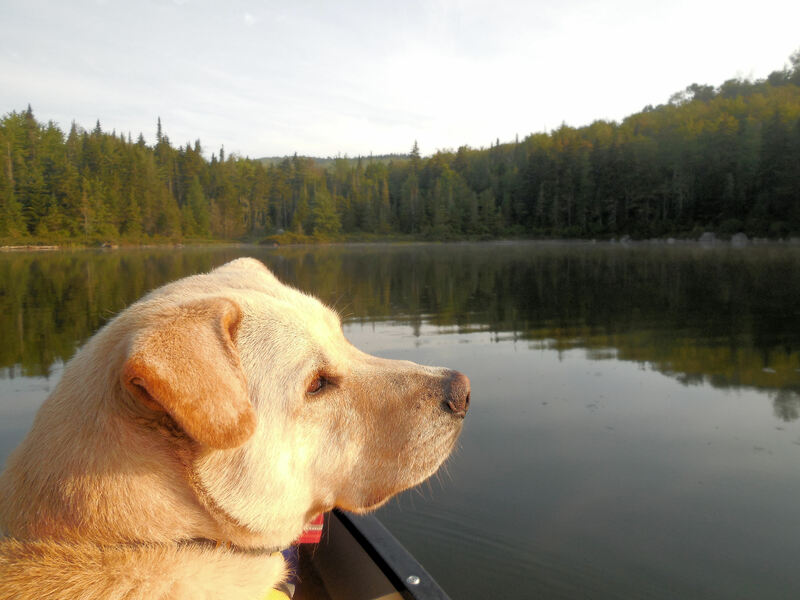 Since we like to be able to head out on short notice, and since my “elderly brain” has forgotten a few items in the past, we now use a canoe camping checklist, which enables us to be sure we have everything we need, even if we grab and go at the last minute. 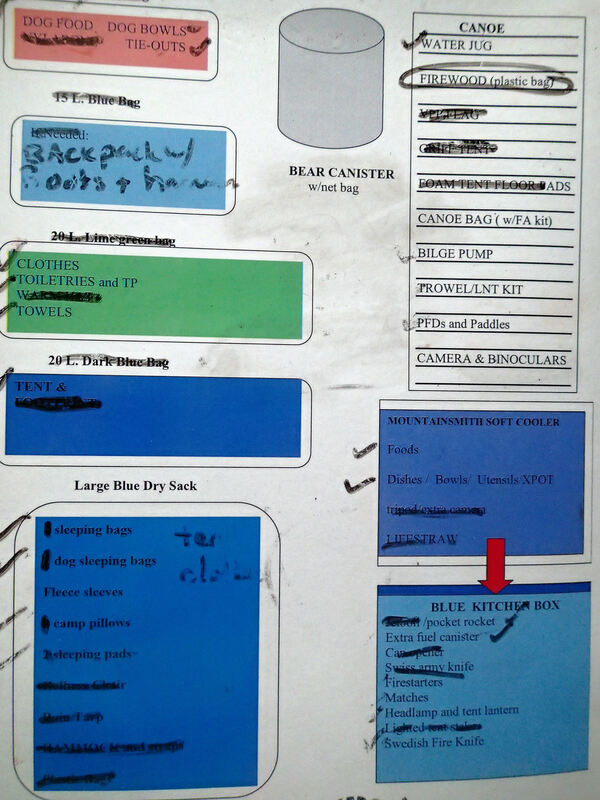 The list is a graphic organizer, which helps in planning what we can actually fit in the boat. It is laminated, used with a white-board marker, so that we can re-use it, for different trips. Since this was a rather last-minute, spur of the moment trip, I was unable to get any of my first 3 choices of sites; instead I ended up with a site in a part of the reservoir where we do not usually paddle. It is not too far from the launch site, but is out of sight of the launch area, and I discovered, is a much hidden little corner of the reservoir. 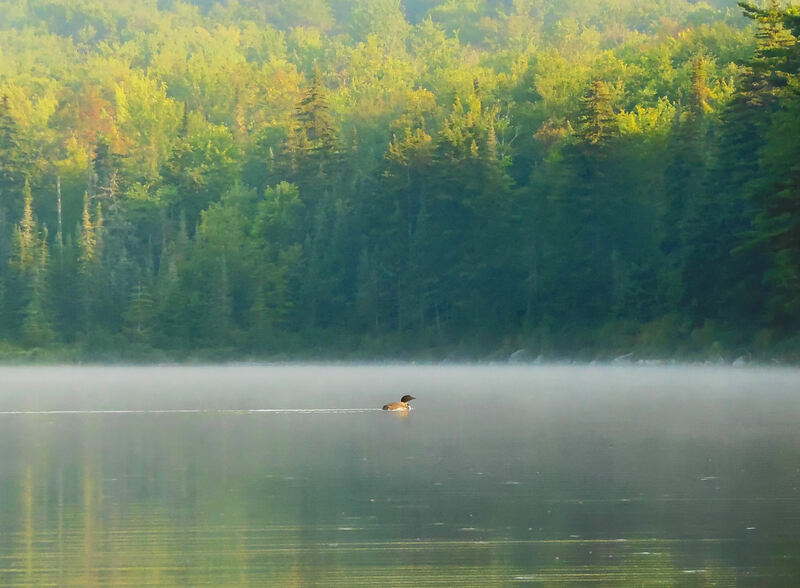 It is frequented by a family of loons, very few paddlers, and some small harmless snakes (based on the skins Gryphon found). The site is on a small rocky outcropping, leading to a few great places to sit on the rocks high above the water, and watch the silent world go by. We had a wonderful time! My 36 year old solo tent served adequately ( more on that later! ), and I found a nice grassy spot to set it, with a view of the water. I discovered that I had under-packed for the solo boat…I actually had room for more wood, and an extra dry bag or two. 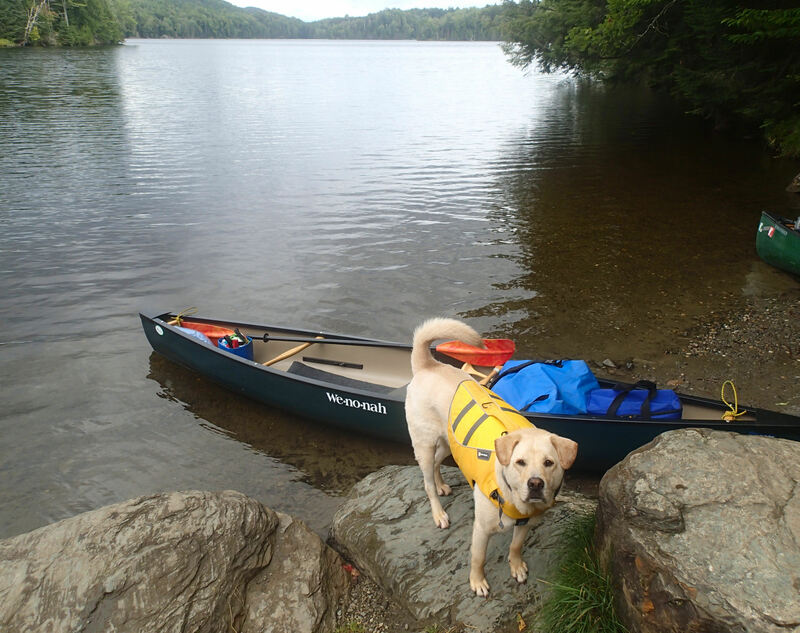 Since this was a solo overnight, I really did not need much gear, but it was nice to discover that I had more canoe capacity than I had thought. Gryphon and I enjoyed our little getaway so much, we actually reserved this same site for another stay, closer to foliage season. I just hope it will not be snowing! When we were driving home, I told Gryphon ( yes, he listens quite well) that I really need to order a new tent…my trusty old Sierra Designs Starlight has a few holes in the netting, few windows, no interior pockets, the material is a bit “flaky” on the interior, and the fly’s rain repellant quality is questionable. At home, I was checking up on my email folder, and noted that I had an interesting message from trailspace.com. More on that to follow….but I am very excited that I will not be ordering a new tent! WooHoo! A new tent, just what we need for our solo adventures! 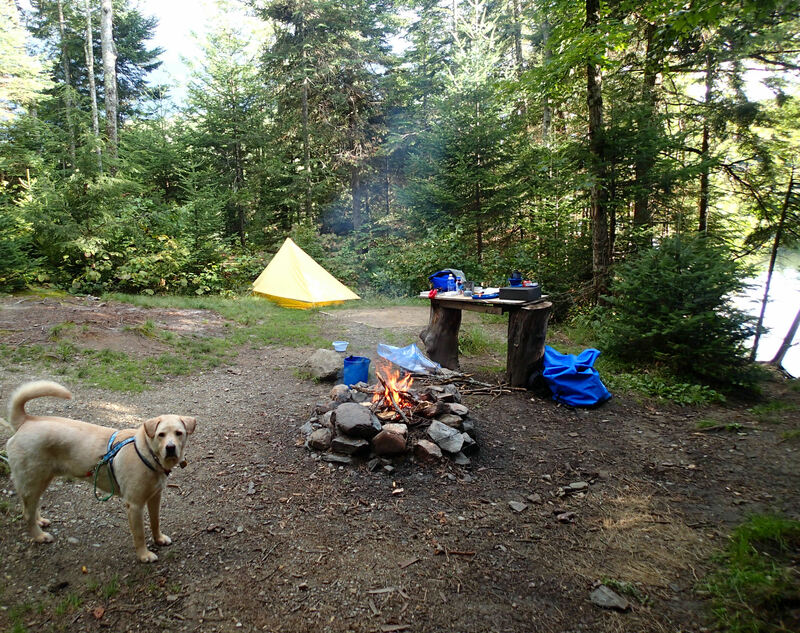 My husband I had scheduled an overnight to a small pond in the Vermont state parks system, where there are only a few campsites, reachable only by hiking or paddling. 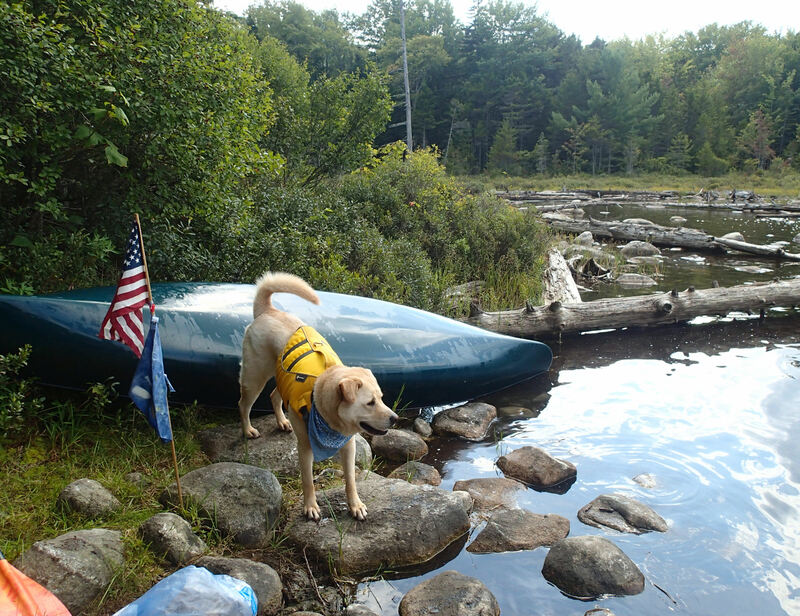 This was to be the first camping trip in which we used the solo boat and kayak…well, music interfered, that is, my husband had a concert to perform, so Griff and I ended up on another “solo” journey. 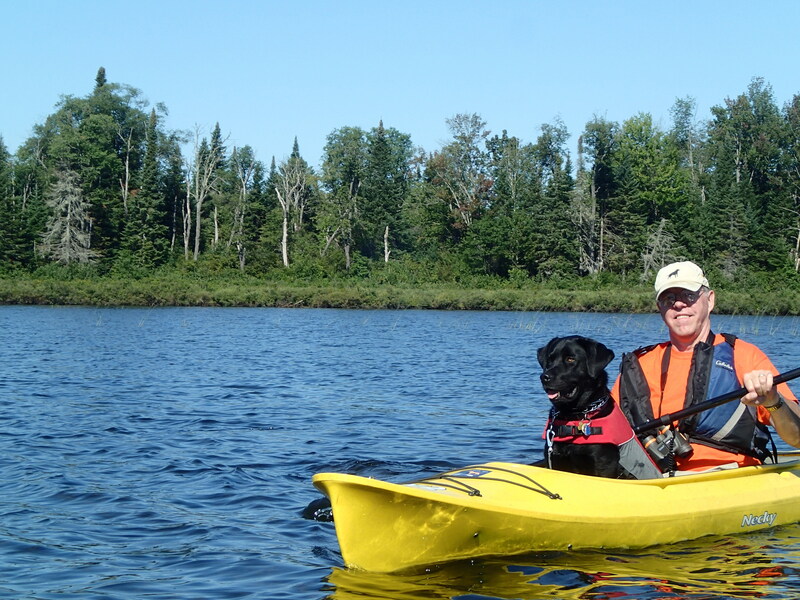 We had spent some time paddling here a few years ago, when we had camped at one of the nearby campsites in this area. It is not a large body of water, and there are only 3 campsites on the eastern shore, so how hard can it be to find one of them? Well, my mistake? I followed the map…and searched, and landed, and bushwacked, and landed again…no site to be found. A nice couple in kayaks also attempted to help, but they struck out, too. Finally, I found the ranger, and he advised me the site was well below its map placement…in an area of very shallow rocky water, and lots of down trees. The take-out was a bit precarious, and my skid plates have not yet been installed on my little boat. But we managed okay, and found a lovely little site, with a lean-to, a luxury not usually found in paddle-in sites. There are nearby hiking trails, so I dug out my boots and Griff’s trekking line, and we went exploring around the pond. 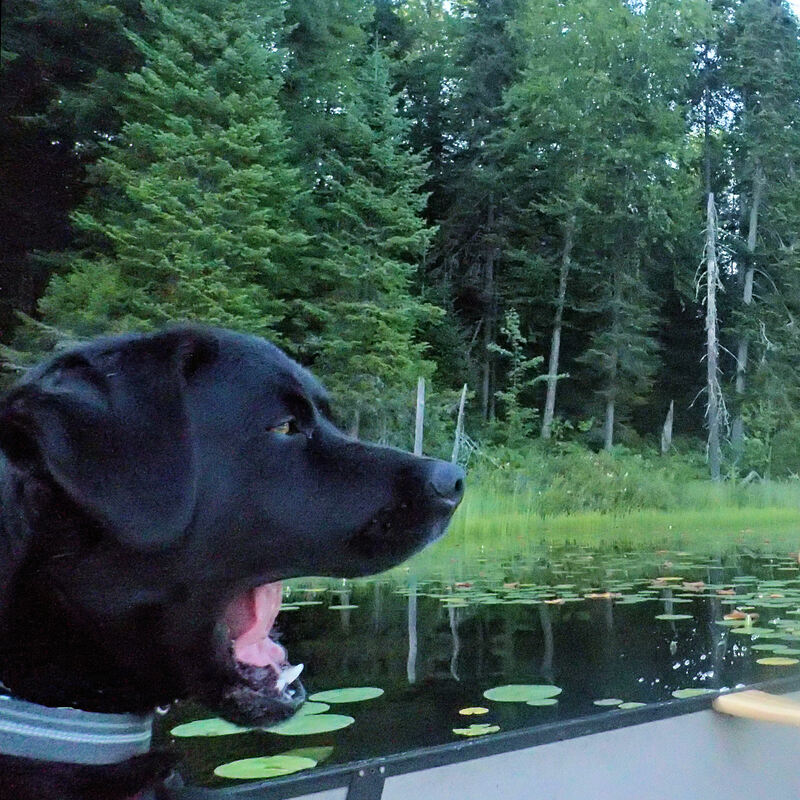 It’s always fun to combine hiking with a canoeing trip; I only wish Edgar and my husband could have joined us! 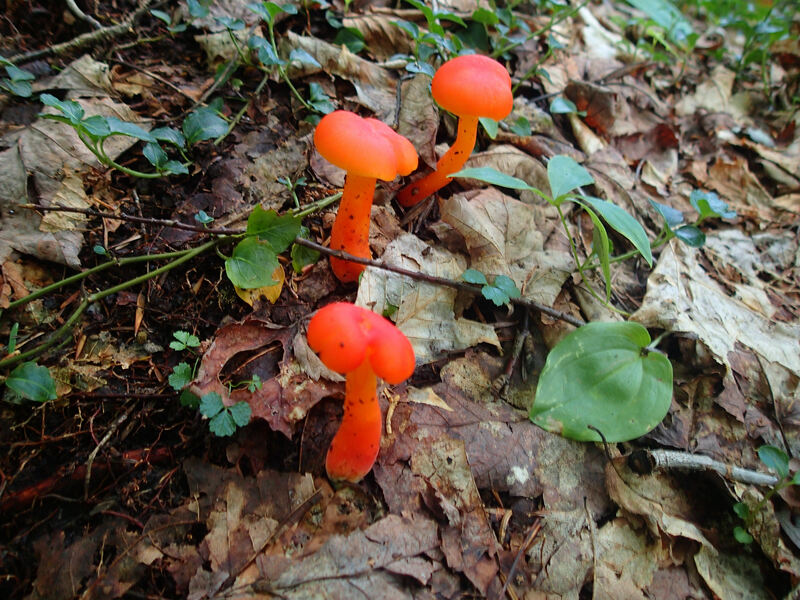 These little guys have on their hunter orange…ready for fall! 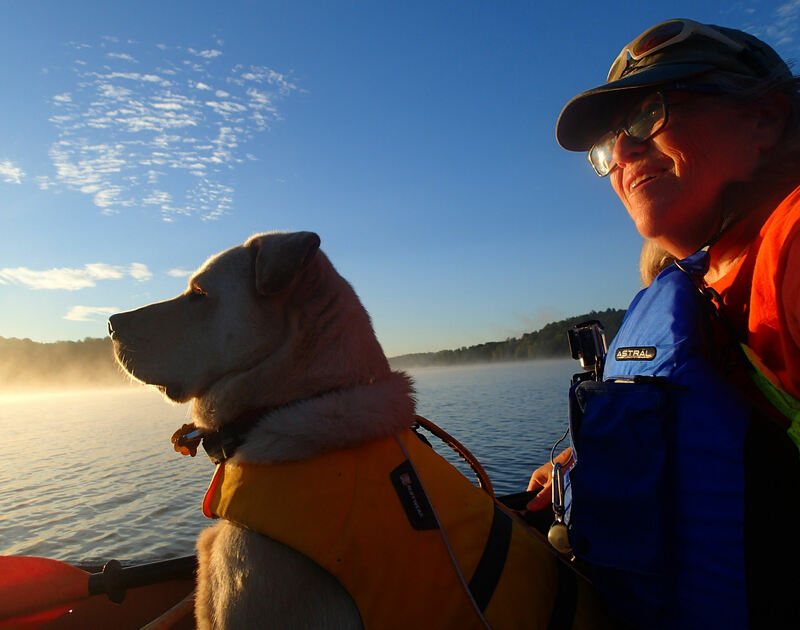 We went out for a sunset paddle, and then early the next morning, a sunrise paddle…glassy surface of the water, loons, and a great flock of herons at the northern end of the pond. Around the campsite, so many little birds, ones I do not usually see at our home…warblers, vireos, thrushes, and a hummingbird who hovered 10 inches from my head. Really a nice little spot for a 2-3 day paddling trip. We have continued to get out for day trips recently, trying to locate some new and interesting sites. We found a Nature Conservancy site, in a rural part of Vermont only an hour or so from our home. We had never heard of Flagg Pond, which is actually a marsh, with water that ranges from only a few inches deep to no more than 6 feet deep. It really is in the “middle of nowhere”, but what a beautiful spot! 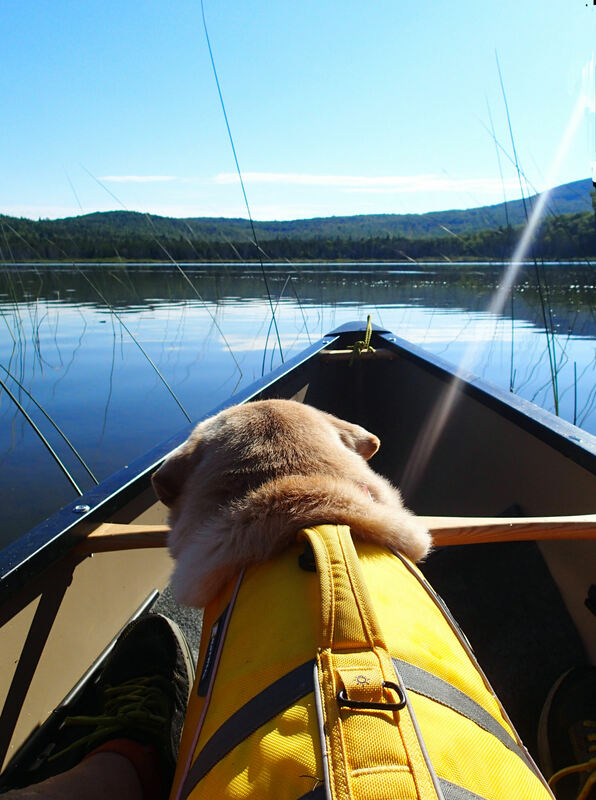 And, as we like it, no one else on the water. We paddled through marsh grasses, and the shallow water allowed clear visibility below. The wind began to pick up a bit, but never really interfered with our great explorations. There is a resident pair of loons, who were generally quite a quiet pair…quiet, that is, until the very large juvenile bald eagle would swoop overhead. 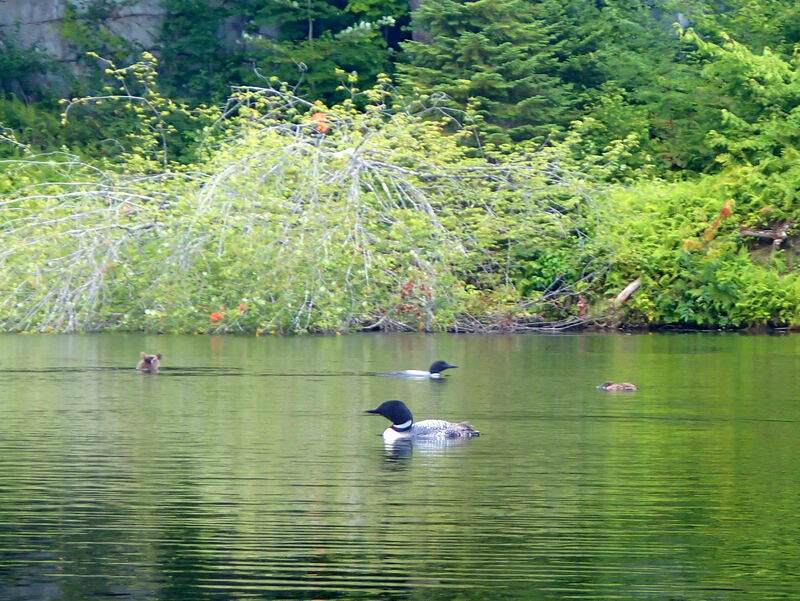 Then the loons let out cries of unease…since we saw no signs of chicks, perhaps the eagle had consumed the loon eggs? 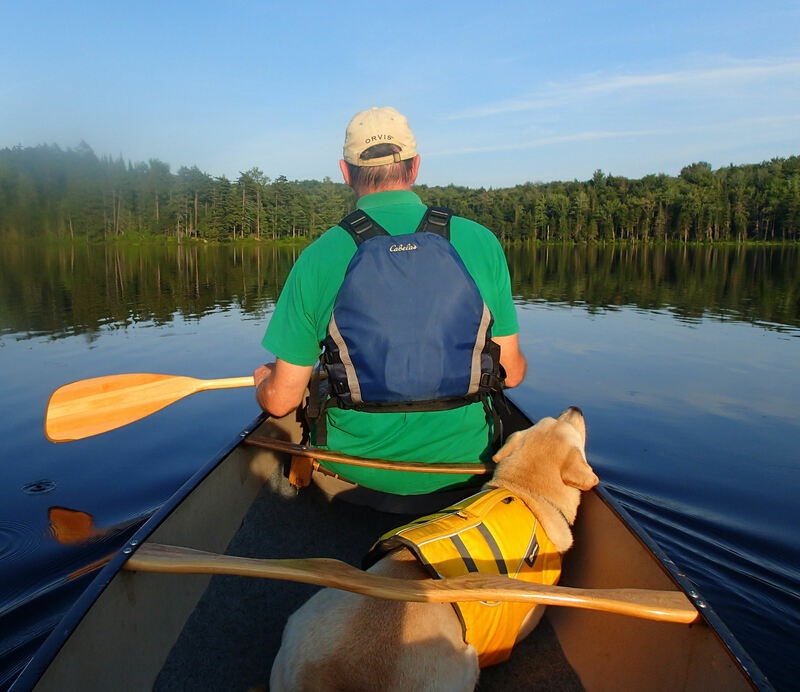 We also made an early evening return to Wolcott Pond…very quiet, peaceful, mirror-like water surface…but we did not see any wildlife until we neared the end of the paddle. 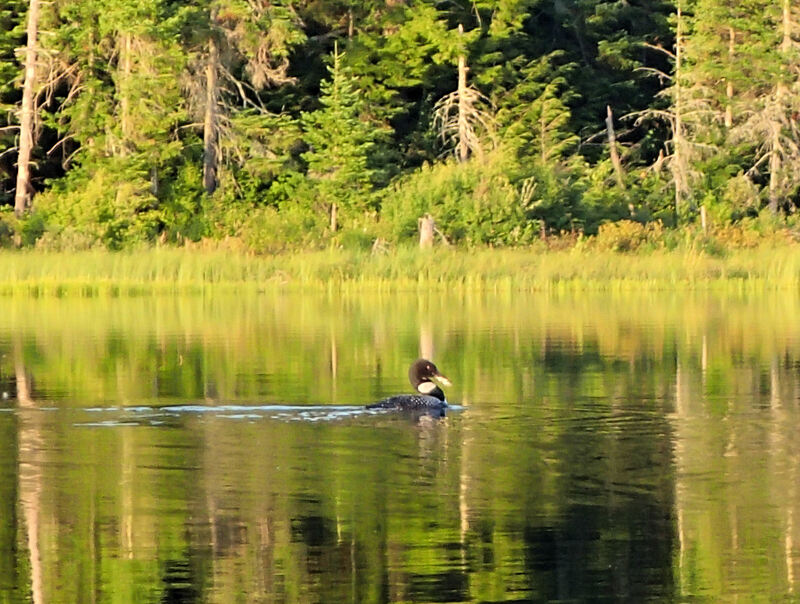 A solitary loon swam out in front of us, and headed off for the back part of the pond. Then, a great blue heron swooped by us, heading for a small pond beyond the launch site. We did note that there are beginning to be signs of color changes in the trees…very early, but despite the 90 degree temperatures, a hint that fall is on its way. 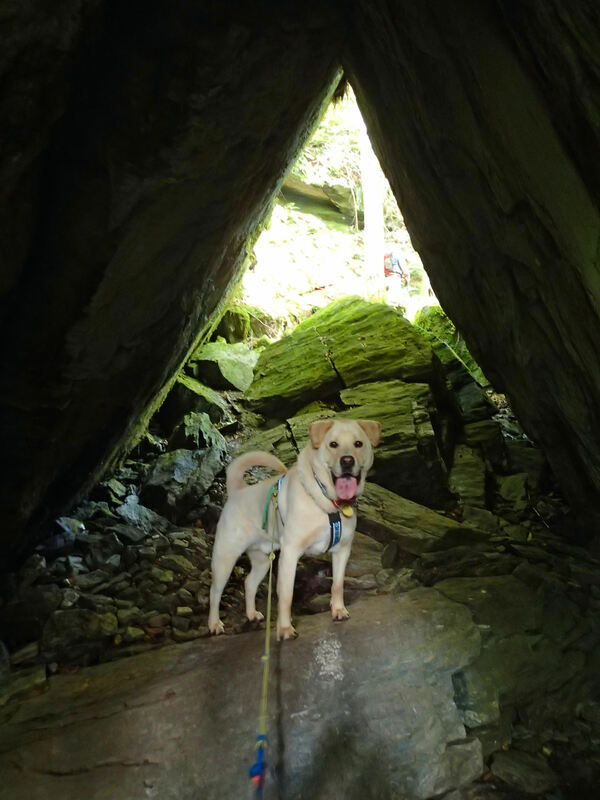 Our hiking adventures have resumed, seeking out fun and interesting places to hike in our neck of the woods. 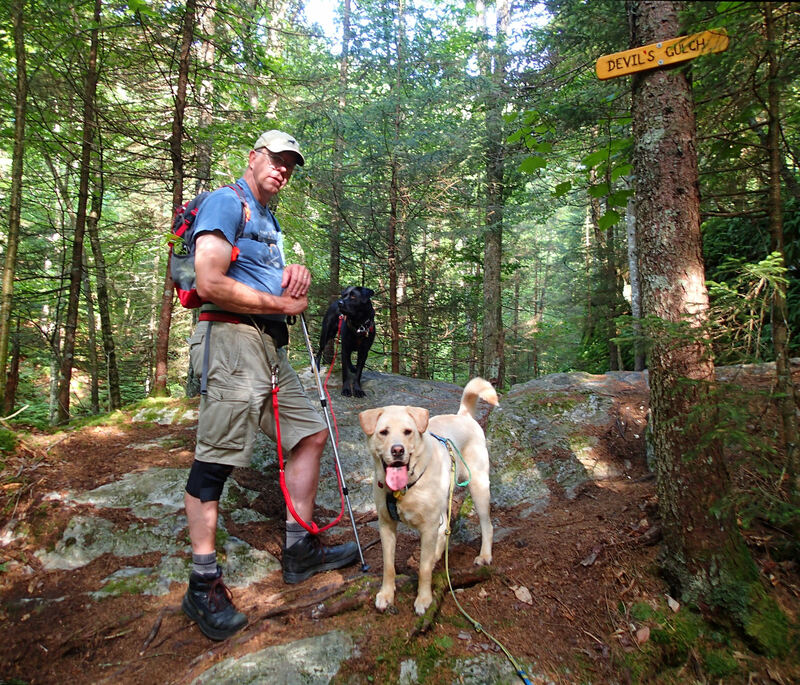 We took the dogs up to a northern section of the Long Trail, to head into an area called Devil’s Gulch. This area is a rocky ravine and, marked by huge tumbled boulders and thick coats of moss, a green and dark mystical area, with rays of sunlight streaming through. 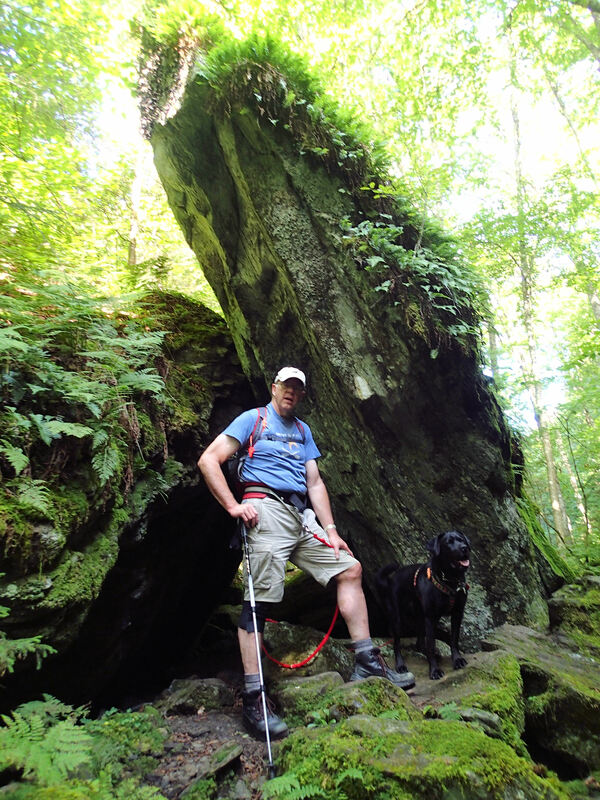 It is not a notably challenging hike (except for a 100 yards of very steep rocky stairs) , but is a fun 3-4 hours, in cool, shaded woods. 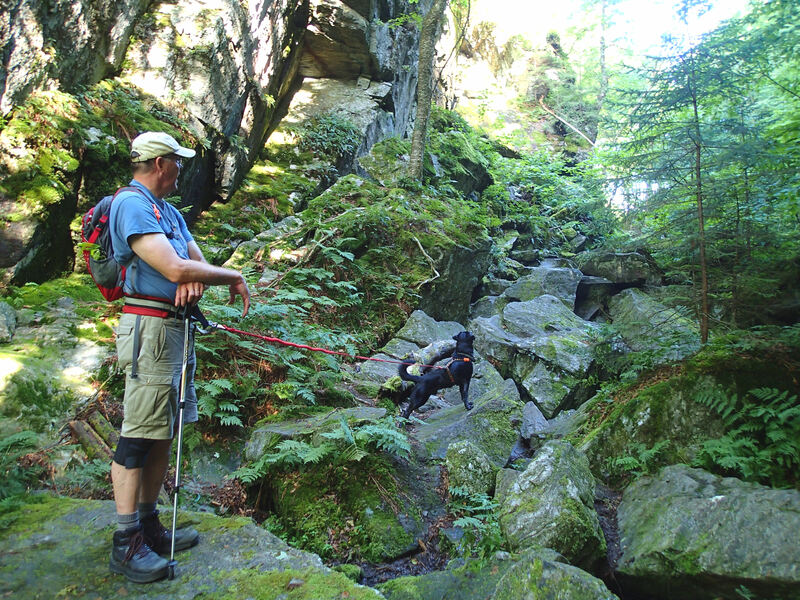 The dogs had to do some scrambling, and we had to assist them in a few spots, but they each performed admirably! 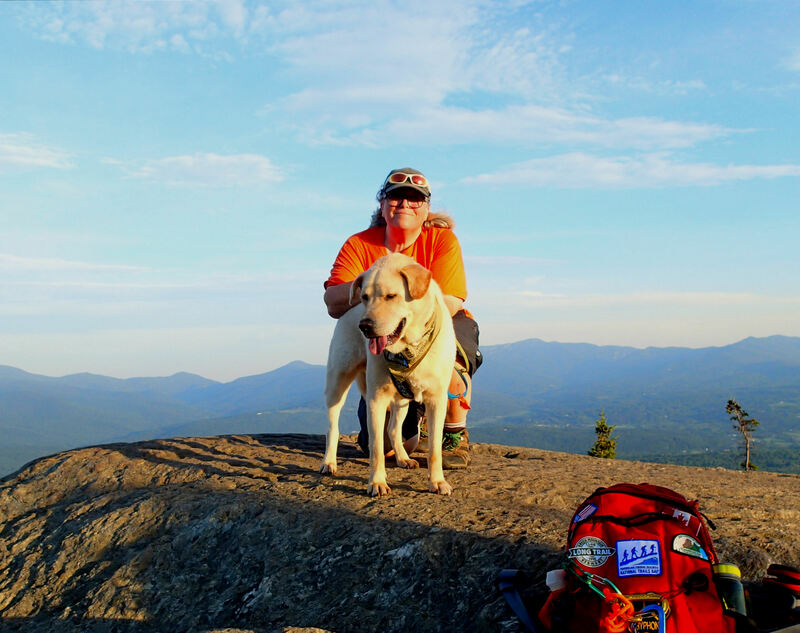 Recently, I headed up our local little peak, Stowe Pinnacle one morning, on the trail at 0520 hours…It was a great hike to start the day, and we were rewarded with great summit views, on a sunny, cool, and very windy morning. 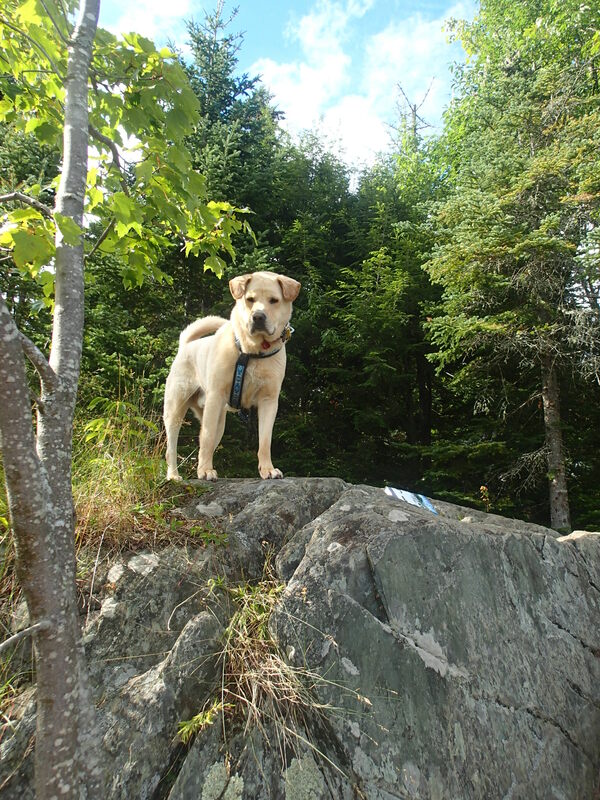 Gryphon loves this hike, but it is so popular, we hike it only on weekdays, and very early in the morning. It was a wonderful way to get back into the “peak-a-week” routine. My second early morning venture was not as successful; we headed out to Elmore Mt, which is also a small mountain we climb frequently…I checked the hourly forecast, and it looked good, cloudy until around 7, then sun by 8. 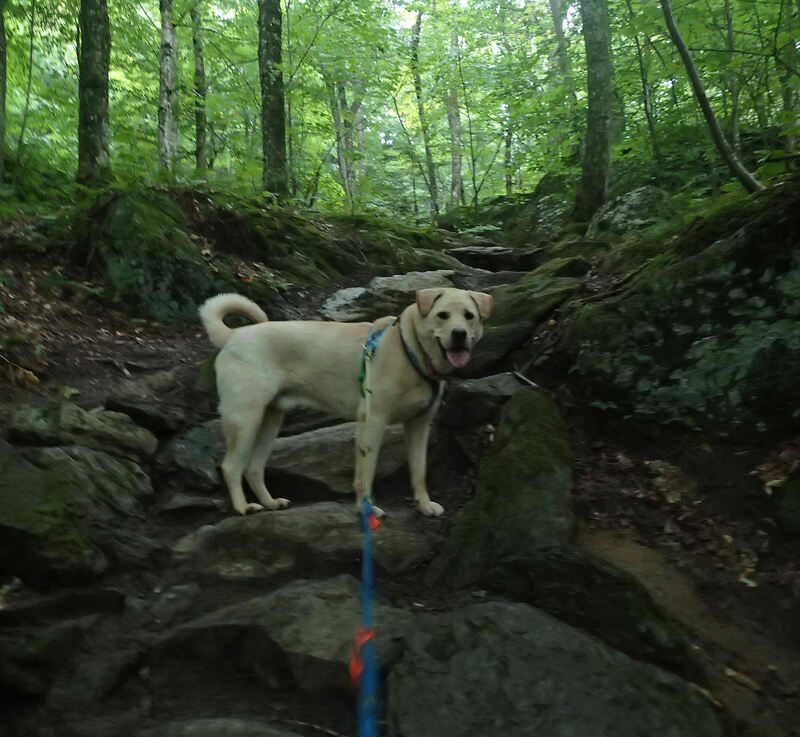 Gryphon and I were on the trail by 6, and were moving along well, until it started to sprinkle…then drizzle, then rain. We hunkered down under a rain-fly, and decided to see if this precipitation would pass, since we were only about 20 minutes from the top. Well, it just began to rain harder, the rocks were getting more slick, and the roots more treacherous. 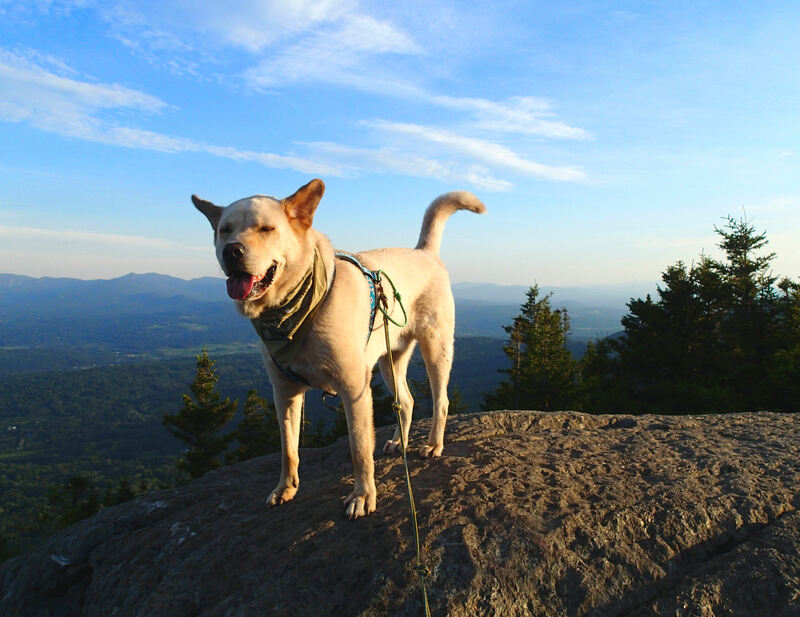 Well, this mountain is not going anywhere, and I decide we would hike down…we’ll return during foliage season, and try to get a sunny sunrise from the overlook! Rain? 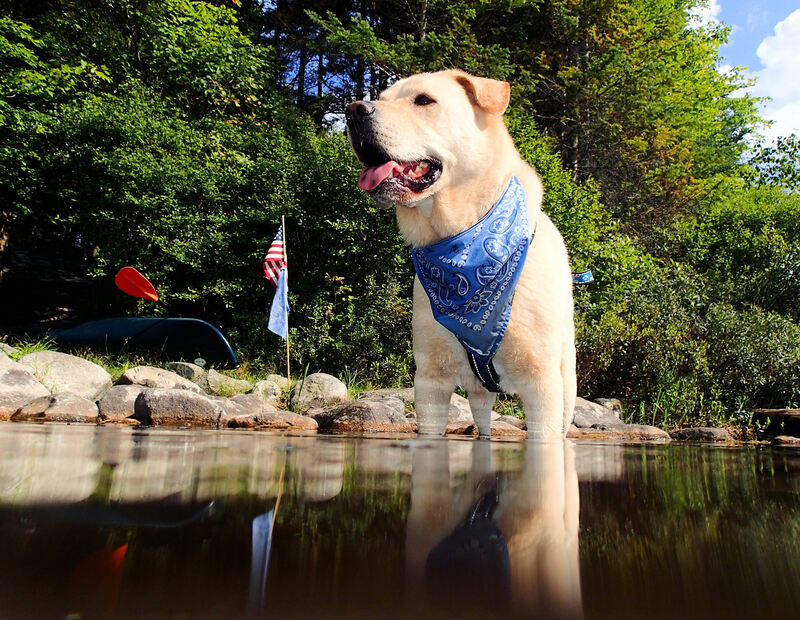 But the weatherman said no rain…..
Summer is coming to a close…but we still have lots of canoeing and camping ahead! We have quite a few more trips planned, and we’re looking forward to the arrival of the beautiful fall colors. The summer tourist season is ending, and there is a few weeks lull before the fall tourists arrive in hordes…Lots of time for us to enjoy our beautiful area!